Reports of Internet addiction have been cropping up for the last several years. In a 2006 study, one in eight US adults showed some signs of being addicted to the Internet. More recently, Internet addiction is being fought in South Korea, which has the highest data throughput to homes of any country in the world. 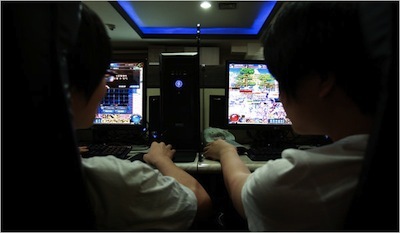 Every evening, the couple, Kim Yun-jeong and her husband, Kim Jae-beom, 41, left their one-room apartment for an all-night Internet cafe where they role-played, often until dawn. Each one raised a virtual daughter, who followed them everywhere, and was fed, dressed and cuddled — all with a few clicks of the mouse. On the morning of Sept. 24 last year, they returned home after a 12-hour game session to find their actual daughter, a 3-month-old named Sa-rang — love in Korean — dead, shriveled with malnutrition. In February, a 22-year-old man was arrested and accused of killing his mother for nagging him about his obsessive playing. In the same month, a 32-year-old man dropped dead of exhaustion in a computer parlor after playing through the five-day Lunar New Year holiday. “Some jobless men come here in hope of a financial breakthrough,” said Hong Seong-in, the owner of a computer parlor. The datasphere was construct delight that first year- I called up information almost constantly, living in a frenzy of full interface. I was as addicted to raw data as the Caribou Herd were to their stims and drugs. I could imagine don Balthazar spinning in his molten grave as I gave up long-term memory for the transient satisfaction of implant omniscience. You may be wondering - "Do I suffer from Internet addiction?" A helpful test has been posted at NetAddiction; it claims to be the first validated and reliable measure of addictive use of the Internet. From NetAddiction, BBC, NY Times. Thanks to John B. for suggesting this story.